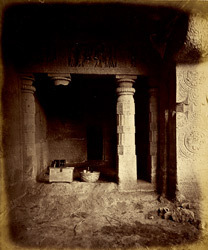 Photograph of the side cell in right end of the verandah of the Buddhist vihara, Cave XXI at Ajanta, taken by Robert Gill around 1868-70, Archaeological Survey of Western India. Gill's stereoscopic camera and basket of chemicals are seen on the porch. The Buddhist cave temples of Ajanta were excavated into a horse-shoe shaped cliff overlooking the Waghora River during the 2nd and 1st centuries BC. Cave 21 belongs to a later series of excavation from the late 5th century. The verandah is ruined, but this side shrine has one of the two fluted pillars left. The architrave has carved panels with Hariti and attendants.